Today's complex products increasingly require the integration of hardware and software development processes, making ALM-PLM convergence one of the hot topics in the industry. Application and Product Lifecycle Management software platforms have been designed to support the development of software and hardware end products. However, they have evolved separately to suit the needs of these two disparate industries. With the emergence of cheap sensors, memory modules, etc., embedded software, and lately, the Internet of Things, products increasingly contain software (and even service) components. Therefore, more and more products rely on software to replace or enhance the functionality of certain hardware parts. The integration of hardware and software development processes, both contributing to the same product, has become necessary. Coordinating the processes involved in product development increases efficiency and synergies. 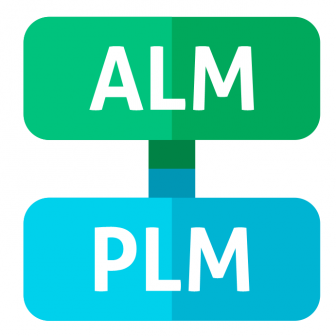 First, let's take a look at the basic differences between PLM and ALM, and why their integration is such a highly discussed topic today. Traditionally, Product Lifecycle Management (PLM) tools (information management systems) have been used by hardware engineering teams to support the physical design & manufacturing of products. PLM comes from the automotive industry, and covers the engineering, design, manufacturing, service and disposal processes of physical products. Such platforms help integrate data, processes and align teams throughout the lifecycle. Application Lifecycle Management (ALM) can be thought of as PLM for software. Similarly to Product Lifecycle Management, ALM encompasses the entire lifecycle, from requirements management, through development, testing, maintenance, all the way to the release and maintenance of software products. Project management, integrated data management and collaboration are important parts of any ALM solution. While ALM and PLM are used for a generally similar purpose (product development), they have evolved in industry sectors or disciplines that used to be entirely separate and fundamentally different. However, information siloed in different data management systems can no longer adequately support the development of complex devices that combine software and hardware, as well as services enabled by network connectivity. Keeping these processes separate could lead to inconsistencies, insufficient quality control, and an increased risk level. With the convergence of hardware and software development, the need for multidisciplinary lifecycle management emerged, and the integration of PLM and ALM became necessary. Since this integration of lifecycles is such a recent need, there's no single silver-bullet solution to it yet. Lifecycle management software solution vendors are just realizing the importance of this integration, and are working to fuse these previously isolated data management systems. Therefore, most development companies are taking a best of breed approach: using tried and tested standalone solutions, and (manually) creating integrations to ensure data consistency. However, manual processes can increase the chance of errors. According to Accenture research, integrating requirements and ensuring consistent change management are the greatest challenges in unifying ALM and PLM. To achieve these goals and to avoid manual errors, a common platform with automatic integration is necessary. codeBeamer has been designed to manage complexity. It lets you handle large volumes of data from different sources, while ensuring complete change control and data consistency throughout the lifecycle. While codeBeamer is by nature an ALM solution, PLM-related data can be easily integrated to allow you to manage the entire process using one platform. Workflows can be interconnected and automated, allowing you to connect processes and automatically create work items to stay in control of complex lifecycle processes. Want to find out more? Contact us or download codeBeamer's free 90-day version right away.